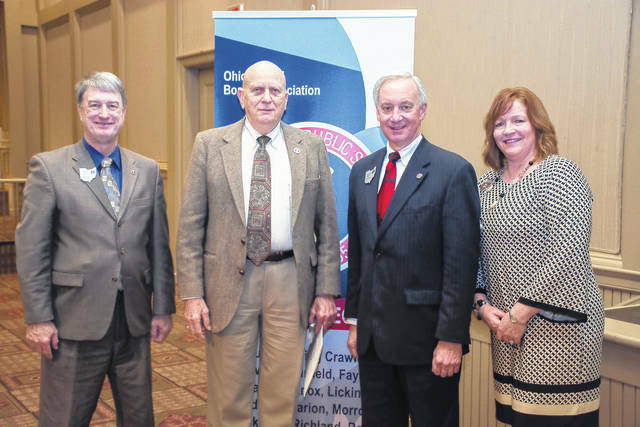 From left to right: Richard Lewis, OSBA chief executive officer (left); Ed Bischoff, DACC board member; Randy Smith, OSBA president and board member of Forest Hills Local and Amy Eyman, OSBA Central Region president and board member, Lancaster City. From left to right: Richard Lewis, OSBA chief executive officer; Tom Kaelber, DACC board member; Randy Smith, OSBA president and board member of Forest Hills Local; and Amy Eyman, OSBA Central Region president and board member, Lancaster City. Two Delaware Area Career Center board members were recently honored by the Ohio School Boards Association. DACC board members Tom Kaelber and Ed Bischoff were present at the Ohio School Board Association’s annual Capital Conference earlier this month, and both given awards by the association. Kaelber was honored for 15 years of service as a board member. Kaelber represents the Buckeye Valley Local School District and has served on the DACC Board of Education since 2010. Ed Bischoff serves the DACC Board of Education as the representative for the Educational Service Center of Central Ohio. Bischoff was presented with the Award of Achievement, a special honor recognizing Ohio public school board members who work hard to become better board members. Recipients must have enrolled and participated in workshops and conferences, as well as volunteering for service to their association and working for their own board. Bischoff has served on the DACC BOE since 1994.